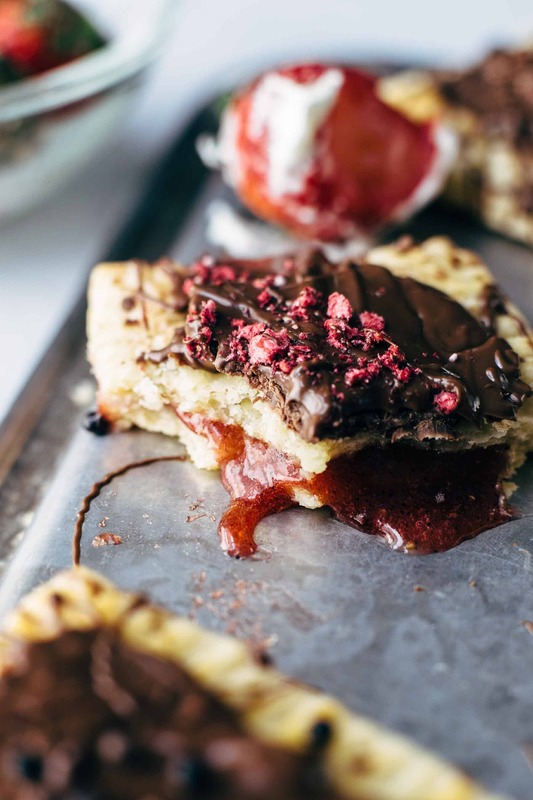 This Chocolate Strawberry Pop Tarts Recipe calls for 11 ingredients. Buttery, flaky pie crust and sweet vanilla strawberry jam both made from scratch. Easy to make + VIDEO. How did you spend the holidays? I hope you had a great time as I had. Bummer that it went by that fast. Do you have any special goals for 2018? My goal for this year is to deliver you great recipes and grow my blog. I’m also thinking about publishing a cookbook or being a part of a baking show on the German TV. Let’s see what this year brings. Just in case, if I write a cookbook would you love a book with American or European baking recipes? OK, let’s get started with the pop tarts. 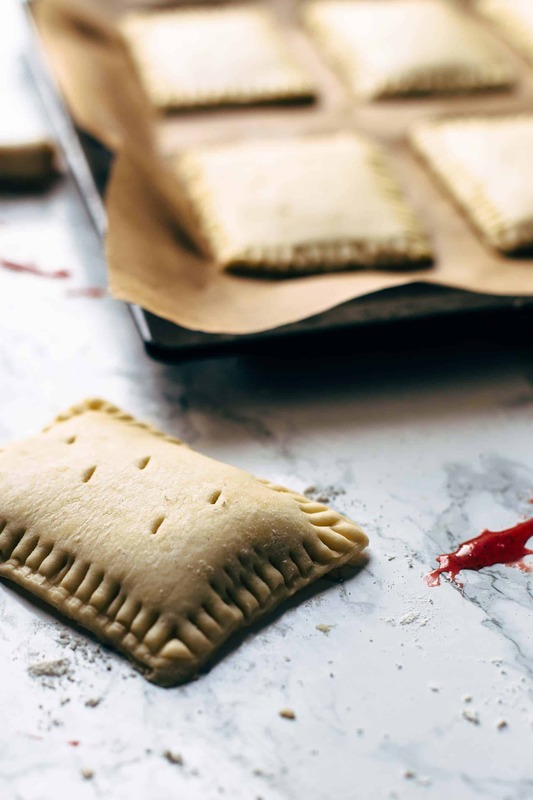 These pop tarts are filled with homemade vanilla strawberry jam. OMG, it’s so delicious. Don’t even think about to fill the pop tarts with store-bought strawberry jam or preserves. Store-bought stuff is not even close that delicious. Being that said, I suggest making more of the homemade vanilla strawberry jam because you can have it for breakfast with biscuits, or waffles, eat it with vanilla ice cream, or whatever you are craving. Would love to hear some creative combinations. Strawberry and chocolate is a great combination. So it was pretty obvious to glaze the pop tarts with pure melted chocolate instead of royal icing. Imagine chocolate dipped strawberries with buttery, flaky pie crust. Yap. Exactly like that. Cook the strawberries with the other ingredients for 5-10 minutes until it reaches the desired consistency. It will thicken when it cools down. The pie crust is super flaky and buttery, and the best is that you don’t need a food processor. Just 5 ingredients, a bowl, and your hands. 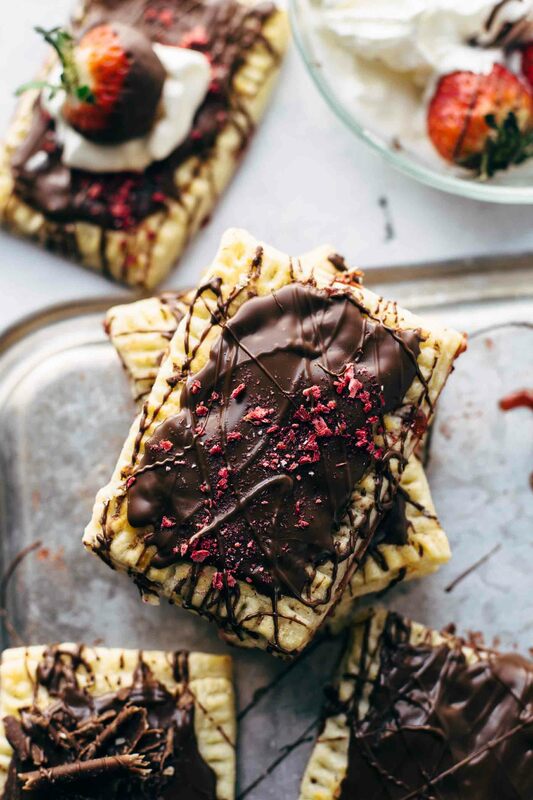 If you make this Chocolate Strawberry Pop Tarts recipe, leave a comment, rate it and tag a photo #alsothecrumbsplease on Instagram! Would love to see your snap! You may also like My Favorite Strawberry Rhubarb Pie, Easy Peasy Mixed Berry Galette, Churro Hand Pies + VIDEO, Homemade Pumpkin Pie Pop Tarts, or click here to see all things sweet. Filling: Blend strawberries with a hand blender until smooth. Place a medium saucepan over medium-high heat and set a fine mesh strainer on top. Pour strawberries through the strainer into the saucepan. Press fruit and liquid through the strainer and discard solids. Bring to a boil for about 5-10 minutes until it has thickened to a jam-like consistency. Stir in vanilla and salt. Remove from heat and let cool to room temperature. Pie Crust: Combine flour, baking powder, and salt in a large mixing bowl. Cut butter into cubes and work them into the flour mixture with your fingers until large pea-sized flakes are still visible. Add sour cream and fold into with a rubber spatula to combine. Knead a few times until it comes together. Transfer the dough to a well-floured work surface. Roll the dough into an 8x10 inch rectangle and fold into thirds like a business letter. 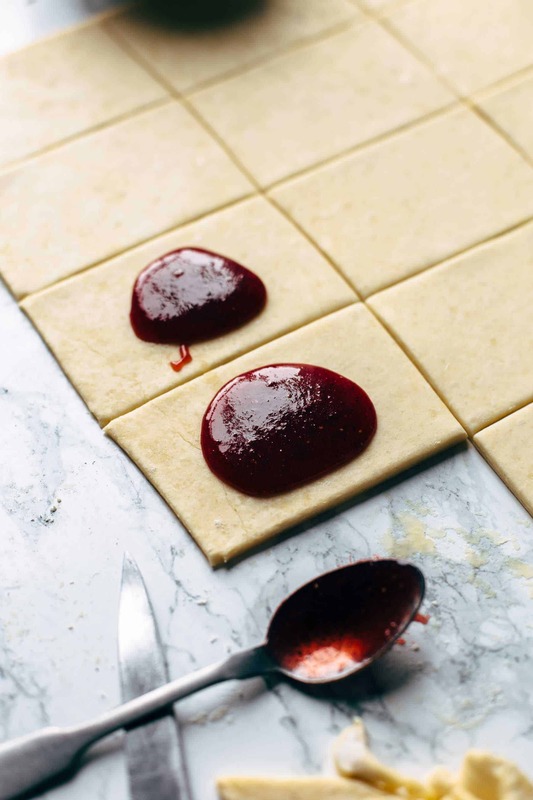 Rotate dough 90° and roll dough again into an 8x10 inch rectangle and fold like a business letter. Cover with plastic wrap and freeze for about 10 minutes. Roll dough out into square or rectangle with a 0.12-0.15 inch thickness (3-4mm). Cut out pop tarts sized rectangles. You will get around 16-20 rectangles. Place one heaping tablespoon filling in the middle of a rectangle. Place another rectangle on top. Seal the edges by using the tins of a fork. Cut 2-3 thin slits into the tops that the steam can escape throughout baking. Repeat until you run out of dough and filling. Brush with egg. Bake for about 22-24 minutes until golden brown. Let cool to room temperature. 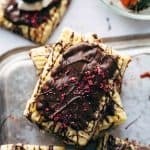 Drizzle melted chocolate over the pop tarts. Store in an airtight container at room temperature up to 2 days. These look incredible Sabine! I’d love to see more German and European recipes. My husband’s family is German and I’d love to surprise them with something authentic and delicious! Can’t wait to see what you have in store. Happy new Year! Thank you so much for your feedback, Coley. I will let you know when I share some German classics. Have a great 2018 with lots of love, joy, and health! Never thought of making homemade pop tarts…. what a brilliant idea!! Thank you so much! It’s very easy to make and should definitely give it a try.